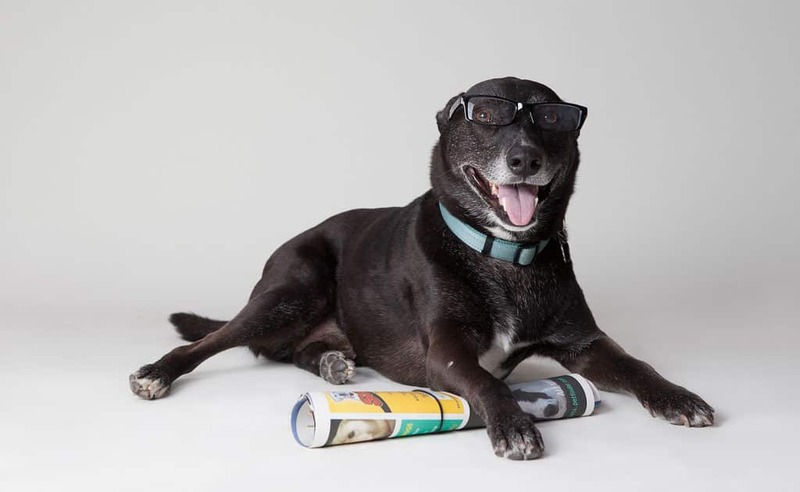 We all know dogs need plenty of exercise and a balanced diet in order to stay healthy; however, many dog owners overlook another important factor: stimulating their minds. In fact, animal experts believe that mental stimulation for dogs is just as important as walks. 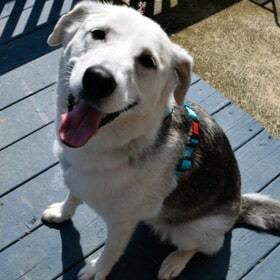 So how can we stimulate our dog’s mind to prevent boredom and promote a happy, health life? Thankfully there are loads of mind stimulating puzzles and toys for dogs including automatic ball throwers. Many of the toys and puzzles use your dog’s sense of smell in order to find a way to access treats, while many new smart dog toy companies can control a game of fetch or puzzles with smartphone apps. Let’s take a quick look at a few of our favorites before diving into the full list. The first and most obvious answer to stimulating your dog’s mind are toys that require your dog to use their sense of smell. 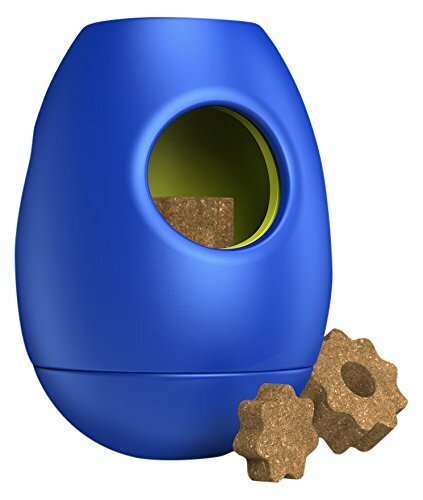 These work by placing treats or kibble into the toys and letting your dog find a way to get them out. There are, however, mind stimulating dog toys that do not require treats, such as the Hide-A-Squirrel which we feature below. These are simply plush dog toys stuffed inside of a larger plush toy. 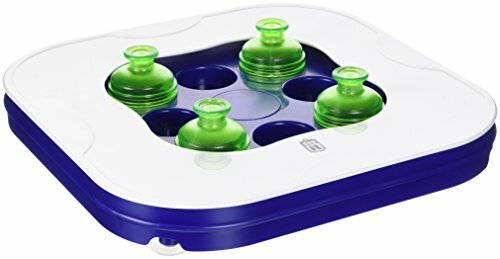 The TIKR activity toy is Sasha’s favorite puzzle, and mine too – because this battery-free toy uses an internal timer to rotate the holes in which treats can fall out. Even better, there’s multiple sizes, so the small treats fall out first, followed by medium and larger treats as time goes on. 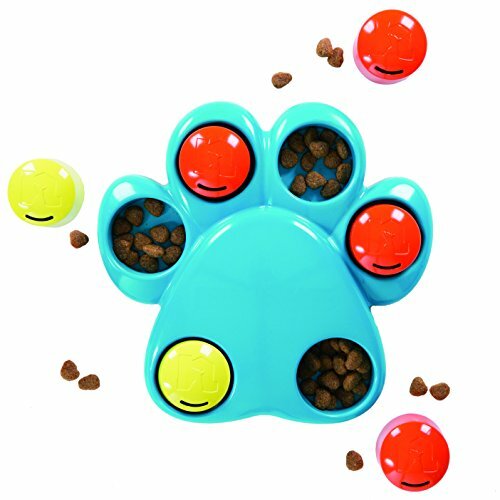 This ensures your dog stays engaged for upwards of 45 minutes instead of quickly getting all of them at once. Kong Wobbler is an all-time classic. Stuff kibble, treats, or even peanut butter inside the tough dog toy and entertain your dog for hours! Check out the video below to see how beneficial these can be for training. 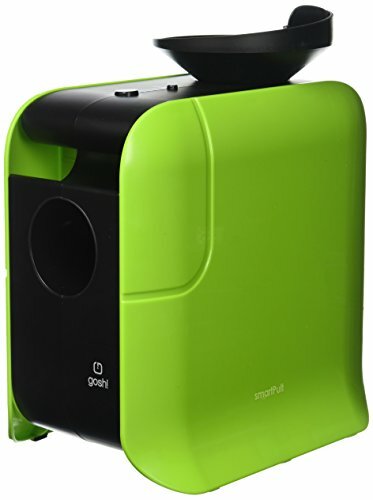 Odin is a creative alternative to the famous Kong toy. 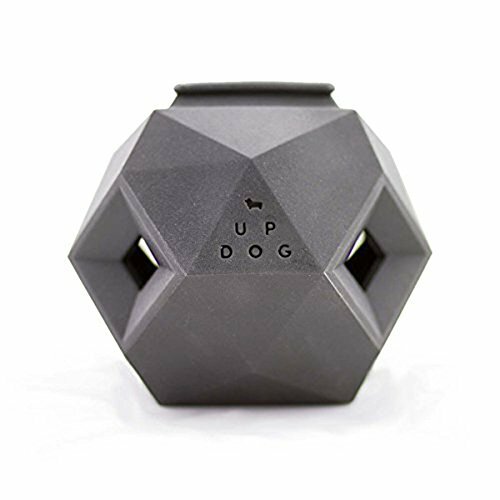 Created by Up Dog, the Odin dog toy works amazing and is a great stimulating toy while also being durable. 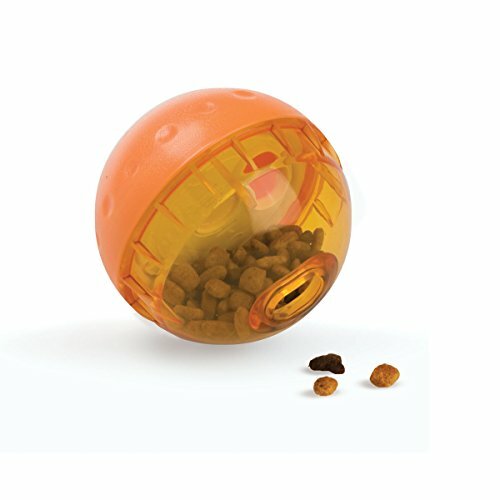 The Our Pets IQ Treat Ball combines a dog toy and puzzle into one. 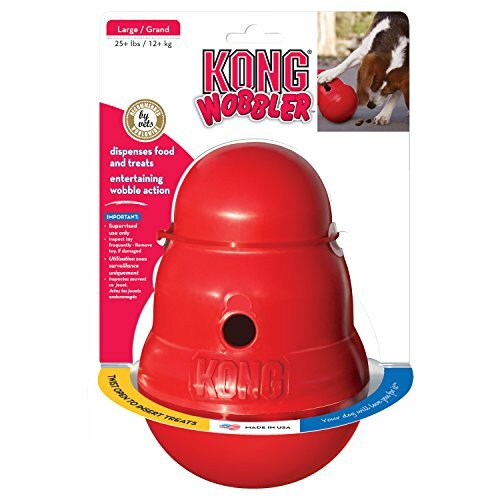 The exterior is made of a durable hard plastic (not rubbery like Kong) and spills kibble when tipped the correct way. 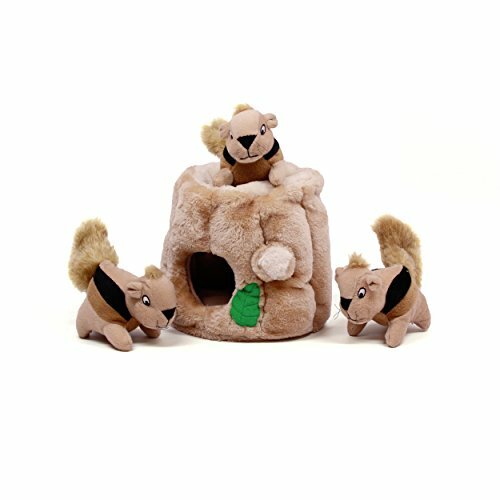 Outward Hound’s Hide-A-Squirrel is an incredibly popular mind stimulating dog toy that does not require treats or kibble. Plush toys are stuffed inside of a larger plush toy. Our dog loves this one! Dog puzzles are an incredible way to make your dogs think. The toys shown above tend to be easier for dogs to get treats from since they usually just involve tossing the toy around until a few fall out or licking peanut butter out of a Kong (we don’t mean to downplay these toys at all though, they are absolutely essential!). The puzzles, on the other hand, require your dogs think about the best possible way to reach the treats since they cannot pick this toy up and shake it around. When first introducing your dog to a puzzle, you may notice they get frustrated. If so, simply show them once or twice how to complete the puzzle and then leave them alone with the game for a while. Before you know it, your dog will master the puzzle and get excited when complete. The Ethical Pet Seek-A-Treat Shuffle is an amazing puzzle that is sure to make your dog think. 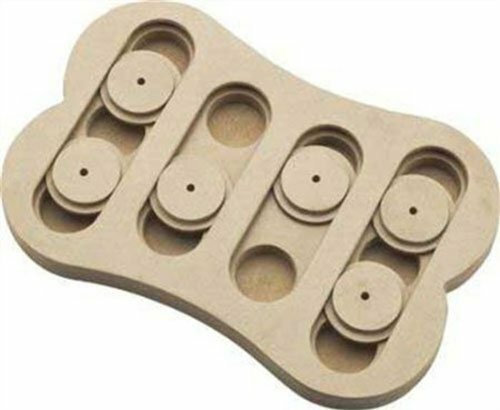 This dog puzzle forces them to slide the little pieces out of the way in order to find treats. The Paw Hide puzzle by Outward Hound is one of our favorites. Your dog will have to pick up each paw puzzle piece to get the treats. Our dog was quick to master this one though, so be sure to change it up! The Dogit Mind Games puzzle is similar to the one above, but quite a bit easier. 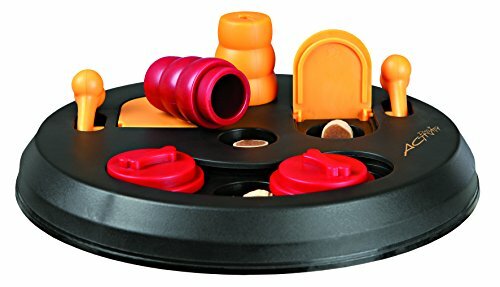 This is a great toy to introduce your dog to puzzles! TRIXIE sells multiple “dog activity boards” which are essentially puzzles with tons of different mind stimulating activities to prevent boredom. We consider dog toys as being “smart” if they are app-enabled or offer functionality beyond hiding treats. This is a really exciting market to watch develop as innovative startup companies such as PupPod begin to revolutionize both the dog food market and dog training. 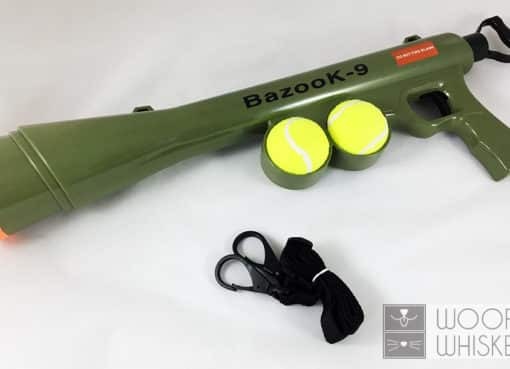 While some of the smart dog toys can be pricey (especially if you’re worried your dog will break it), there are also automatic ball launchers which is a great solution because you can always buy replacement tennis balls! Here are our favorite smart dog toys. 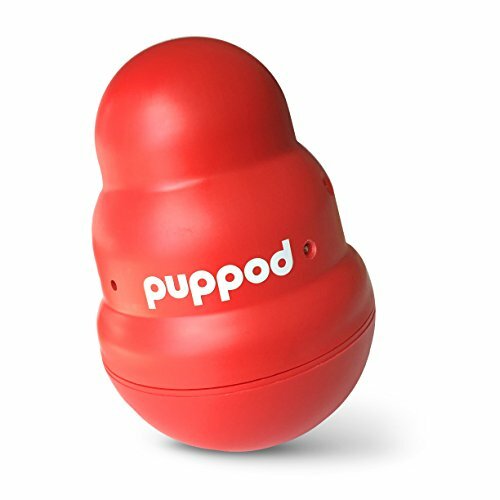 PupPod is an app-enabled smart toy that uses the durability of the Kong Wobbler and increases in difficulty as your dog learns. This incredible puzzle toy uses a series of lights, sounds, and timers to alert your smartphone when to hand your dog a treat. Dog trainers have been raving over this toy as an optimal solution to prevent boredom and many have transitioned to completely feeding their dogs through this method. To take it even further, PupPod partners with the Pet Tutor Bluetooth Dispenser to fully automate the game. Instead of getting an alert on your phone telling you when to toss a treat, the treat dispenser will automatically integrate with the PupPod Wobbler to reward your dog. The entire bundle is up there in cost, but the mental stimulation benefits your dog receives is insurmountable. Automatic ball launchers are a new and exciting way to play with your dogs that promote incredible exercise, training, and mind stimulation. Automatic ball throwers work by placing a tennis ball into the opening which then launches the ball anywhere from 10 feet to 50 feet, depending on the model. Take a look at our full in-depth review of the best automatic ball throwers to get a better understanding of each type and to see which would fit your dog the best. 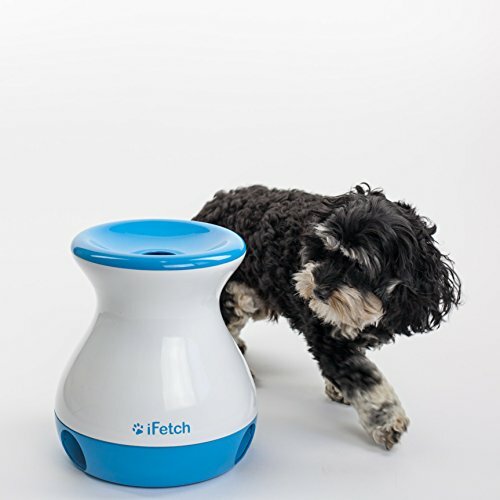 The iFetch Too tosses full-sized tennis balls up to 30 feet and promotes mind stimulation by enabling your dogs to place the ball back into the chute to reload and launch again! 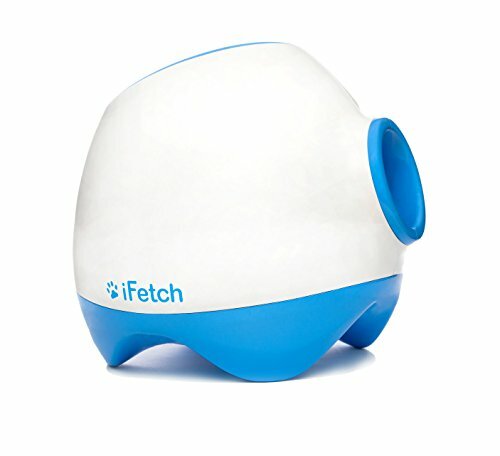 We have a full length iFetch Too review for more information. 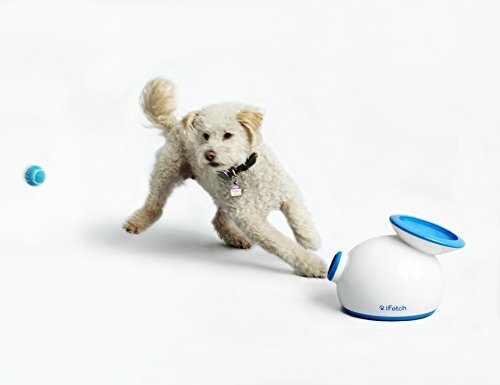 The SmartPult combines a game of fetch with reward by dispensing treats once your dog returns the ball. This is an incredible training mechanism in addition to exercise. 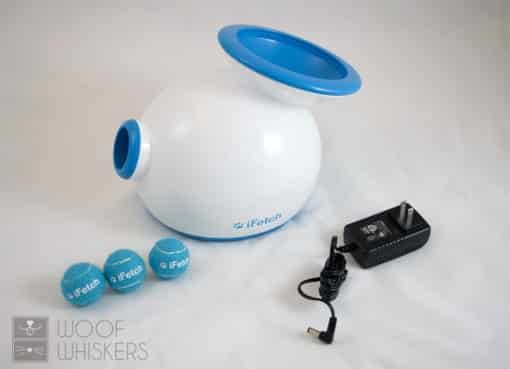 The iFetch Frenzy is great for small dogs and does not require any power. This simple game works by having your dog place the ball in the chute and letting it roll back out in a random direction.